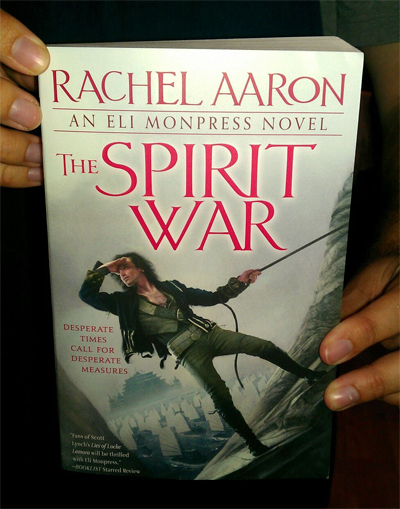 Pretentious Title: The Spirit War Give Away! Blogged the link on my tumblr!... aprilonline! Can't wait for the release! Buwahahahahaha! Flogged it on my facebook! Also had to share Eli's fabulous "two bird minimum" quote! Thats 3 entries right? Must join more social networks! Agghhhhh! Will have to get more clever with the other entries since I have none of these other accounts. "OK, just that first bit in the sampler, about the door, makes me want to read these books. Thanks :)"
And I posted on FB (tagging you in the process). Thanks! Can't wait to read it. Two separate Facebook account shares and a blog post! Part of me hopes I don't win so I'll be forced to spend money on you (I've yet to have the honor); the rest is like, "Heck and who cares. Eli by hook or by crook!" I'm gettin' my "Spirit War" either way, so best of luck, everyone! I love this series!! I have told all my friends about your series, word of mouth is awesome :D I also posted about it on FB, and here is my link: https://www.facebook.com/stacey.lee.marin. It may be the fantasy film capital of the world, but sometimes, there are REALLY LAME DOWNSIDES to living in New Zealand!!! Picking the Winner for Day 1 now! Remember, all of you are still in for days 2-6 and the grand prize!! Spread the word! Shouted out on Facebook, Twitter and my blog. Twittered about it, https://twitter.com/#!/ezzierae/status/201002009430720512, facebooked it and I follow you on twitter. Posted on Facebook (private, but I tagged you in it,) Twitter, and Google+. Shared on my facebook and liked you on my Facebook. Posted on Facebook...and I've been following you-No, not that way, honest-on facebook since before the contest. 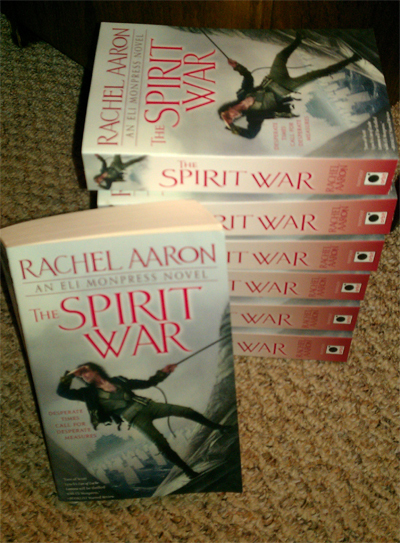 Looking forward to The Spirit War. 1) I posted an entry on my (newly created) blog. 2) Posted an Eli bookmark on DA. 3) And I posted another tweet. Wooo! Picking the DAY 2 winner now! The new book looks great! 1) Followed you on Pintrest and pinned a few covers. 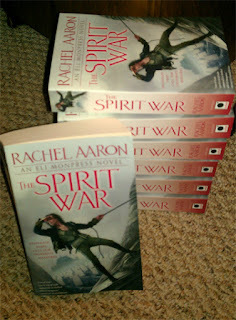 2) Mentioned Spirit War on the Sword and Laser book club forums. Following you now on twitter, pin interest, and my favorite tumblr. I'm rather excited about the omnibus. Facebooked it again. Either way, can't wait to have this sitting next the omnibus! I'm posting about this on Facebook.....looks like great reading! I'm always glad to do my bit to promote exciting new works. Somehow I always miss these things! Hopefully I'm not too late this time. :) Posted on Facebook, will be linking around elsewhere soon. 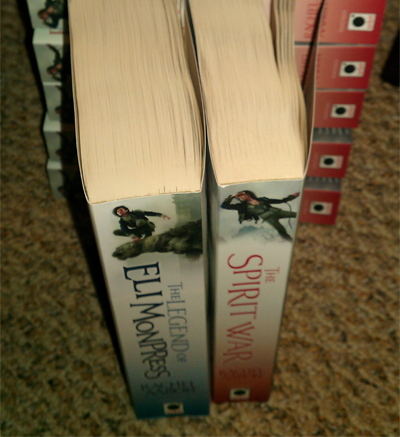 I hope I win an omnibus, because I've not read any of these yet and I'm dying to! Love the steampunk connection. Picking winner 3 now! Thank you all SO MUCH! Posted on FB and on Pinterest! I hope I'm posting this entry correctly to be entered. ... I'm not on Twitter, so I'll have to see where/how else I can think of to post the news. I followed you on tumblr (moonlullaby) and reblogged the deadskunk quote because it is a thing of beauty. I'm not entirely sure this counts but I've got the Spirit War entry for our library district's SFF newsletter ready and raring to go, I'm just waiting on our suppliers getting their acts together so I can order it. @Jenni that totally counts! Any way of helping to get the word out!! And we're picking the next winner now! Now following you on facebook so put my name in the hat please. Started following you on Pinterest (I'm Kate Sape)and...I just liked your page on Facebook (Eli Monpress). I posted about the contest yesterday and today on twitter. Counting up comments for the final winner now!